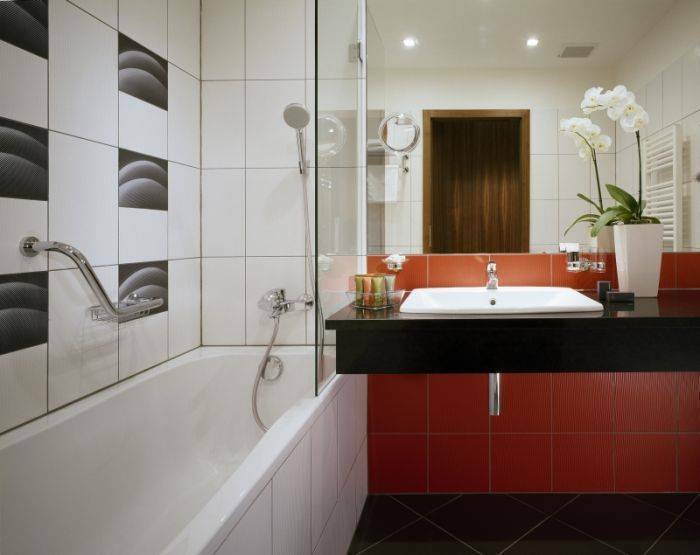 The new four-star Hotel Silenzio is located on the southern slopes of the legendary Hanspaulka district in Prague, which is famously characterized by its modern 20th century functionalist architecture. The exceptional nature of the area is reflected in its impressive First Republic villas, as well as its attractive functionalist houses, embassies, foreign corporate buildings and institutes of higher education. This area also has the highest proportion of greenery of all Prague suburbs. It is within easy reach of the Metro, Ruzyně International Airport, Prague Castle, Prague monasteries and historical palaces, the Loreta Church complex and the Stromovka, Ladronka and árka parks. 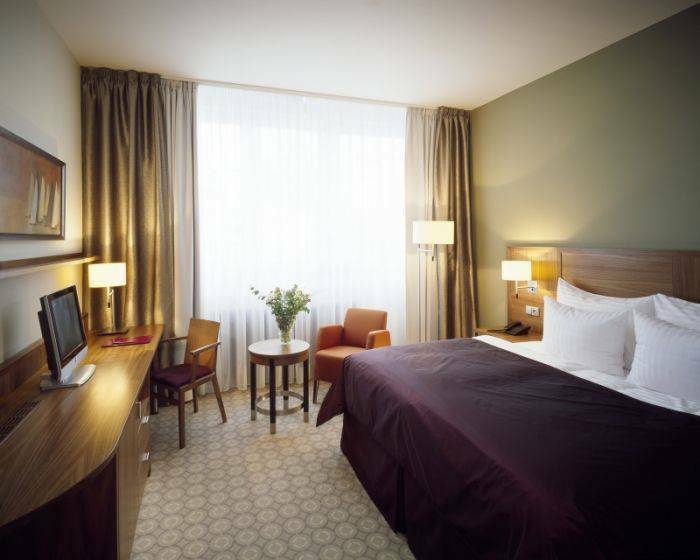 The hotel offers high-standard accommodation and services. The building, fixtures and furniture are modernist-based and designed to optimally perform their function, distinguished by their practicality and straightforwardness, their light, high-quality materials and harmonious curves. The hotel is suitable both for a business and tourist clientele. All the rooms and apartments have convenient modern furniture and fittings, including LCD satellite television and Pay TV, air-conditioning, mini-bar, digital safe and high-speed (Wi-Fi) internet access. The hotel has non-smoking rooms, one of which is adapted for disabled guests with obstacle-free access. The modern lobby bar shows that great emphasis was placed during its design on its function and practical use, with the operational purposes of the hotel in mind. The use of leather and various other materials perfectly highlights the style of the lobby. The outdoor terrace extends the living area with a place for open-air relaxation. The buffet table in the lobby offers an extensive breakfast to suit guests' national cuisines and the season of the year. Business hotel services are also offered. Clients have the opportunity to hire the conference room for corporate and private events. Our team can organize meetings for clients from arrival to departure, including transport, tours of Prague, attractions, team-building sessions and catering. For guests we are ready to provide individual and group guide services and entertainment programmes. The hotel also has an enclosed outdoor car park. The hotel car service can also be ordered to and from the airport. Metro and other public transport stops are just a few minutes away. The hotel is secured by a security and online camera system connected to a security agency round the clock. All rooms have air-conditioning, a safe, a fire sensor, fire doors and carpets with non-flammable certification. The doors have security locks and are opened by means of chip cards. A drive-up ramp provides easy access for wheelchair users. The reception desk is open all hours. Guests have their own car park at their disposal. 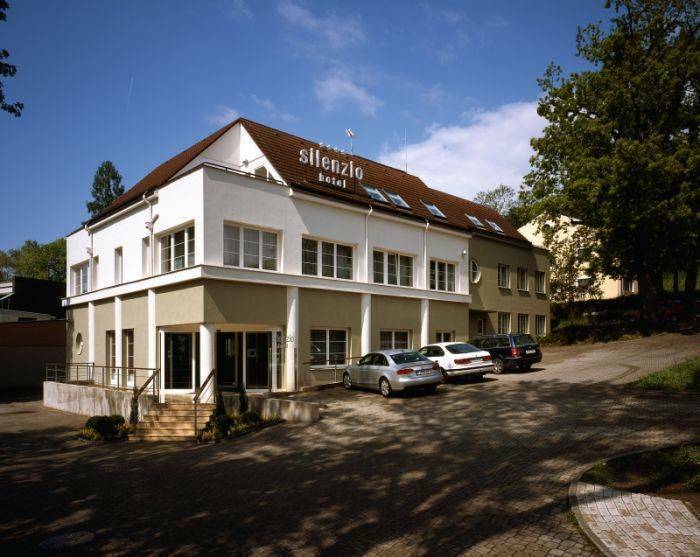 Hotel Silenzio is located in a distinguished, quiet suburb which nonetheless has a strategic position close to the centre and Ruzyně Airport. Just a few steps away there is a tram stop for service nos. 20, 26 and 2, which will take you to Dejvická Metro station or to the centre. You can get to Dejvická station on foot in ten minutes. From Dejvická station city bus no. 119 goes to Ruzyně Airport or you can change for the Airport Express . Contracted and private carriers and taxis also run to and from the airport. From Holeovice station you can get to the hotel by Metro via Dejvická station , then take the tram one stop to Thákurova, . The Airport Express also runs directly from Holeovice station to Dejvická Metro station , then take the tram one stop to Thákurova, or walk for ten minutes from Dejvická. From Hlavní nádraí you can go by Metro to Dejvická station , then take the tram one stop to Thákurova, e. g. tram 26 to Thákurova, . This location is connected from Dejvice via Evropská ul. to the city circular road, from which you can easily drive via the Strahovský, Mrázovka a Zlíchovský tunnels to the D1 motorway to Brno, the D11 motorway to Hradec Králové, the D5 motorway to Rozvadov and the D8 motorway to Dresden. For the most varied company and family events we offer the lease of a 60-seat lounge with refreshments and conference facility options (data-projector, screen, flipchart, videorecorder/DVD/TV and internet/WI-FI). Every inquiry is dealt with individually. Hotel Silenzio has a total of 29 rooms and three apartments, some with a terrace, in which elements of modernism and art deco come to life. 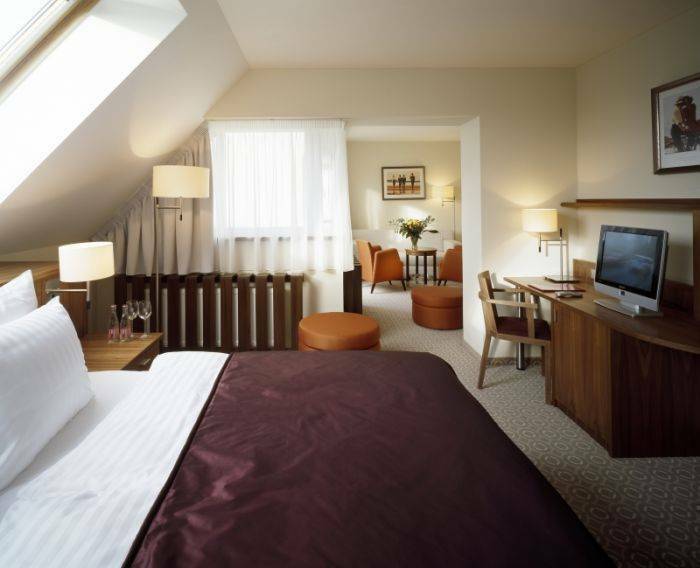 You can choose between a single, a double or a twin room. One room is specially equipped for the disabled with its own obstacle-free access. 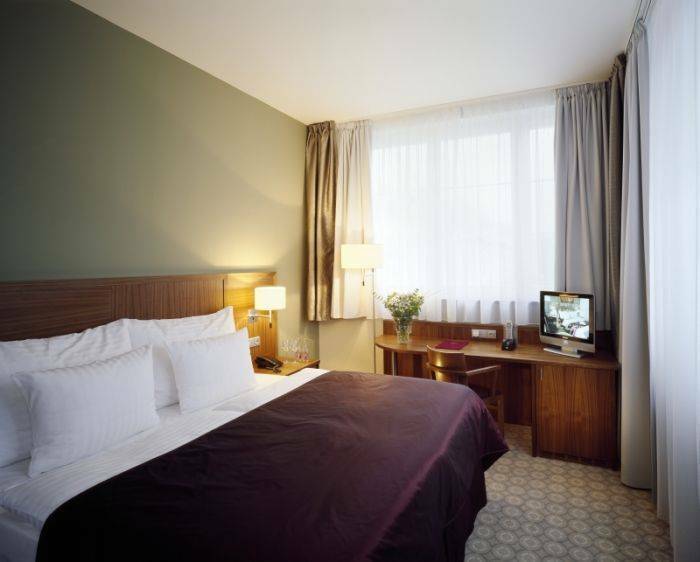 All rooms are comfortably and elegantly appointed. Other facilities include a desk, direct dial phone and internet access, a mini-bar, a DIGI Laptop safe, air conditioning, fire sensors, international satellite TV and Pay TV, security locks and non-flammable carpet. The bathrooms have a bath or shower and are equipped with a pistol dryer and cosmetic mirror, while a cot and a children's toilet seat are available for youngsters. Wi-Fi is available throughout the hotel premises. The hotel is proud to be able to invite its guests to a finely laid buffet table which lacks for nothing. It also offers hot and cold meals and drinks, together with bio-foods and vegetables. Room service is available throughout the day. All the rooms and apartments have convenient modern furniture and fittings, including LCD satellite television and Pay TV, air-conditioning, mini-bar, digital safe and high-speed (Wi-Fi) internet access. The hotel has non-smoking rooms, one of which is adapted for disabled guests with obstacle-free access. Cancellation before 14:00 h 1 day prior to check-in possible without penalty. No-show or cancellation up to check-in day possible with a penalty of 1 night's stay. Hotel Silenzio is located in a distinguished, quiet suburb which nonetheless has a strategic position close to the centre and Ruzyne Airport. Just a few steps away there is a tram stop for service nos. 20, 26 and 2, which will take you to Dejvická Metro station or to the centre. You can get to Dejvická station on foot in ten minutes. From Dejvická station city bus no. 119 goes to Ruzyne Airport or you can change for the Airport Express . Contracted and private carriers and taxis also run to and from the airport. This location is connected from Dejvice via Evropska ul. to the city circular road, from which you can easily drive via the Strahovský, Mrázovka a Zlíchovský tunnels to the D1 motorway to Brno, the D11 motorway to Hradec Králové, the D5 motorway to Rozvadov and the D8 motorway to Dresden. Just a few steps away there is a tram stop for service nos. 20, 26 and 2, which will take you to Dejvická Metro station or to the centre. You can get to Dejvická station on foot in ten minutes.